Here at TALLY WEiJL, we design the latest FASHION MUST-HAVES of the season just for you! Our TREND TEAM is continuously travelling the world, discovering the hottest trends and pinpointing the latest styles. Back at our Basel main campus, our design teams work relentlessly to create diverse collections and source the best materials. You’ll find everything you need in our ONLINE STORE and, as well as in one of over 900 stores spread across 39 countries. 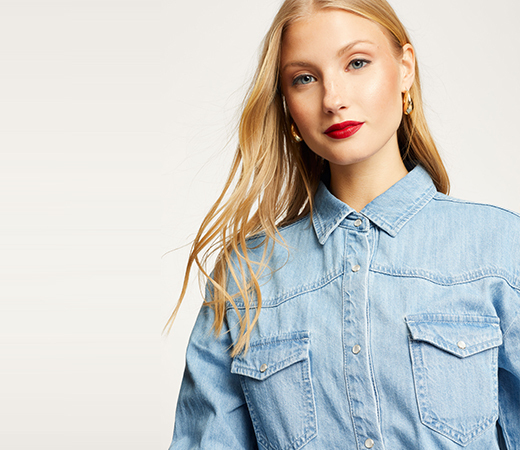 From ultra cool denim styles to flirty dresses, you’re sure to find the PERFECT OUTFIT and ACCESSORIES - from day wear to evening and everything in between. TALLY’s got you covered head to toe! THE BEGINNING - The amazing success story began in 1984 in a small garage in Switzerland, where Tally Elfassi-Weijl developed her first fashion designs. While studying at the Hotel School in Lausanne, Tally Elfassi-Weijl found the time to create 12 collections yearly with a small budget. In their little Fiat, Tally Elfassi-Weijl and her business partner, Beat Grüring, began supplying and delivering garments themselves to large Swiss fashion houses and boutiques. Their ability to deliver the TALLY WEiJL trends within just two to four weeks was revolutionary, and “just in time” became the key for success. FIRST STEP - Very early on, the pair decided to set up their own stores, as it would allow them to grow a stronger relationship with customers. In 1987, Tally Elfassi-Weijl and Beat Grüring opened their first TALLY WEiJL Store in Fribourg, Switzerland. Then in 1993, the small-business concept lead them to incredible expansion in Switzerland with their first franchise partners. NEW MARKET - The concept was a huge success. Exceeding their wildest dreams, TALLY WEiJL began its journey, flourishing in new markets. In 1997, TALLY WEiJL opened its first store in Germany and just 3 short years later, its first store in Poland. In 2000, TALLY WEiJL had over 50 European stores and continued to expand at an unbelievable pace. INTERNATIONAL EXPANSION - Over the next several years, TALLY WEiJL gained more ground, steadily opening more than 100 stores per year! Today, TALLY WEiJL is one of the top global players in the fashion retail industry, boasting over 900 Stores in 39 countries worldwide. From the main campus in Basel to the offices and stores around the globe, TALLY WEiJL employs over 3,400 people worldwide. Still today, Tally Elfassi-Weijl works closely with the creative team in charge of every collection, whilst Beat Grüring manages business operations. stores per year! Today, TALLY WEiJL is part of the top global players in fashion, boasting nearly 800 Stores in 38 Countries all over the world. From the Design Center in Paris to the Service and Support Center in Basel to the offices and stores around the globe, TALLY WEiJL employs over 3,400 people worldwide. In charge of every collection, Tally Elfassi-Weijl works closely with the creative team while Beat Grüring manages the company affairs.